"B&W is now working on the final designs of the reactor. 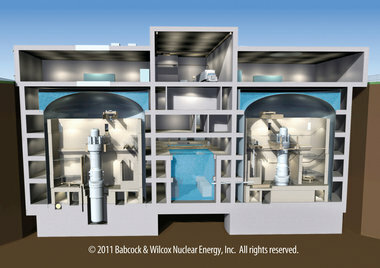 It plans to submit a completed design for the reactor to the Nuclear Regulatory Commission by the end of 2013. Licensing could take several years, but the NRC has already begun gearing up to handle what it thinks will be an influx of competing designs for small reactors. B&W's Barberton facility is involved in the design of the small reactor, and the reactor could even be built there, said Chris Mowry, president of the B&W division that would produce the small reactor."